How can I get more information about FODMAPs? Check out our free guide, blog as well as the FODMAPs tab on our website. We also encourage you to consult your doctor, dietician or other appropriate healthcare professional. How do I know your products are low-FODMAP? 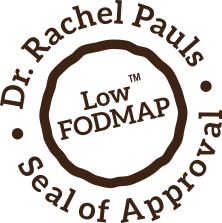 When we decided to create Rachel Pauls Food we looked for a laboratory test that could scientifically analyze food for FODMAP content. We discovered that there was no lab in the U.S. currently doing this type of testing, so, working with a food-testing laboratory, we developed a test to analyze food and determine the level of FODMAPs. This test verifies that our food is low-FODMAP. When you see the Dr. Rachel Pauls Seal of Approval, it means that the product has been scientifically analyzed and verified as low-FODMAP and contains less than 0.5 g of total FODMAPs per serving. Is a low-FODMAP diet gluten-free? No; a low-FODMAP food plan is not always gluten-free. A low-FODMAP diet modifies intake of certain carbohydrates, and gluten is a protein. No; we know our customers appreciate not having to pay for shipping. Can you ship internationally (outside the United States)? Unfortunately not at this time but it is something that we are actively considering. If you are living outside the United States and would like to see Happy Bars shipped to your country please reach out to us and let us know. Can I set up automatic deliveries? Not yet but stay tuned because we are looking at adding an automatic delivery feature. Can I order through Amazon? No. We are very careful about the process by which our products get from our kitchen to your door. With Amazon we would lose control over this process. How do I purchase wholesale orders for resale? Please contact us at info@rachelpaulsfood.com. We want you to be completely satisfied with your purchase. If you are not, we are happy to review your issue and provide a refund when reasonably appropriate. For refunds, please email info@rachelpaulsfood.com or leave a message at 513-954-8087. Please include your order number (located in your order confirmation email) with any email or telephone message.